Julie Madden – I’ve loved and owned multiple dogs most of my adult life, ranging from Yorkshire Terriers to German Shepherds and the occasional Labrador mix. Two of our dogs were rescues, and I was always struck by how grateful they seemed for the little things that our other dogs took for granted. My interest in dogs always had to fit around my day job, though. I spent 32 years with the federal government, starting in the U.S. Army, then as a civilian employee working for Department of Energy and the Centers for Disease Control and Prevention. I had lots of different jobs but always seemed to be involved with starting up and implementing programs, strategic planning, and communications. As I got closer to retirement, I began thinking about what I wanted to do with the rest of my life. I had fallen in love with a dog activity called K9 Nose Work® that I started in 2013 with my German Shepherd Mocha. Mocha had been a cute, stubborn puppy that grew into an 80 pound diva that reacted badly to other dogs. Because dogs are trained one at a time in nose work (and stay in a crate when not working) even reactive or very shy dogs can participate. It was transformational in how it helped Mocha by giving her a job, burning energy and building trust between us. I decided to complete the requirements to become a certified nose work instructor (CNWI™). I wasn’t sure exactly what I would do with nose work in retirement, but I knew I had to share this great tool with other dog owners experiencing challenges with their dogs like I had with Mocha. I became an associate instructor in 2016 and a full CNWI™ in 2017. I retired in December 2016 and went to the Cheaha Regional Humane Society to volunteer my services to teach nose work to shelter dogs. 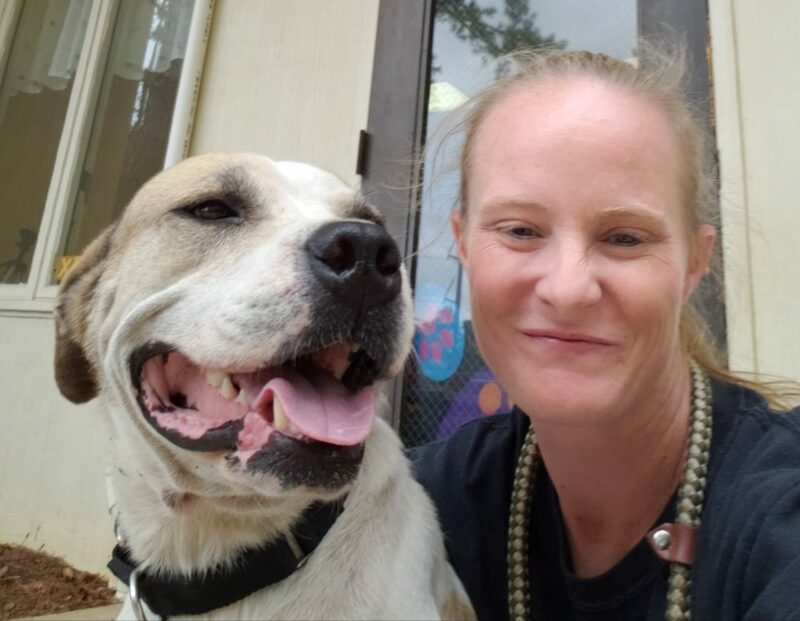 I quickly learned that our local shelters struggle and do an incredible job just keeping up with the daily demands of feeding, cleaning, and medical care, while working with the public on lost pets, strays, and animal surrenders. There just isn’t much time or space to conduct enrichment activities to help the dogs. I did some other volunteer work at Cheaha along with my husband Tom, and we felt frustrated that we couldn’t do more to make things better for all those dogs. In the summer of 2017 I started looking for a larger space to teach my nose work classes. As Tom and I searched online and drove around, we stumbled onto the former United Cerebral Palsy building in Anniston. It had been vacant for three years and UCP was anxious to sell it. It was much bigger than what I needed for my nose work classes. But as we walked through it, we were struck at just how perfect the facility was to bring in shelter dogs and provide enrichment activities. We talked and talked and came to the decision that this was meant to be. If we were serious about wanting to do something to help shelter dogs, and if we were willing to commit our own resources and work very hard, we could do something to help make a difference. We started this journey and hope you will join us in helping shelter dogs! Tom Madden – I always wanted a dog when I was a child but my father refused to get one. As I learned years later, it was because he had a dog when he was young and the dog ran out into the road and was killed by a car. The pain he went through because of the loss was something he didn’t want his own children to experience. It’s ironic, because I have owned dogs almost my whole adult life, and have experienced time and again the sadness and pain of losing them. But I feel that the pain is not an unreasonable price to pay for the joy, laughter and silliness they bring to us their entire lifetime. And I believe that when you lose a dog, you should do two things. One, sit down and write about some of the wonderful happy memories you have of them. Reading it will bring you great joy many times over. And two, when you are ready, get another dog and give it a good home. The best tribute to the dog that left your life is to open your life to another one. And I know lots of great dogs in our area shelters that would make wonderful pets! I started my career in the U.S. Army at the ripe age of 19. I earned my second lieutenant bars through Officer Candidate School, my jump wings through Airborne School, and my flight wings through Flight School. I spent 10 years in the Army. I met my wife Julie just a few months before I got out. I was a captain, she was a lieutenant, and I ordered her to like me. We’ve been married for 37 years so I guess it worked out. I received both my bachelor’s and master’s degree from Jacksonville State University. I’m proud of my accomplishments from a 37 year federal government career, including my final assignment as the Chief Information Security Officer at the Centers for Disease Control and Prevention. When I retired, Julie was still working, so I spent lots of time discovering YouTube and perfecting my cooking skills. 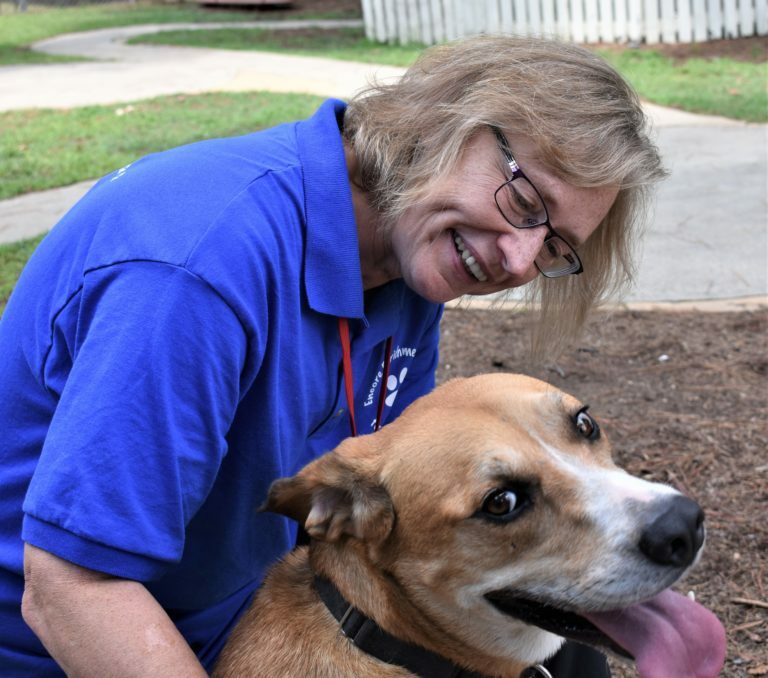 Once she retired, we began looking for ways to give back to the community and we thought that working with shelter dogs was a great match, given how much we both love dogs and how much we have learned over the years in raising multiple, sometimes problematic pets. 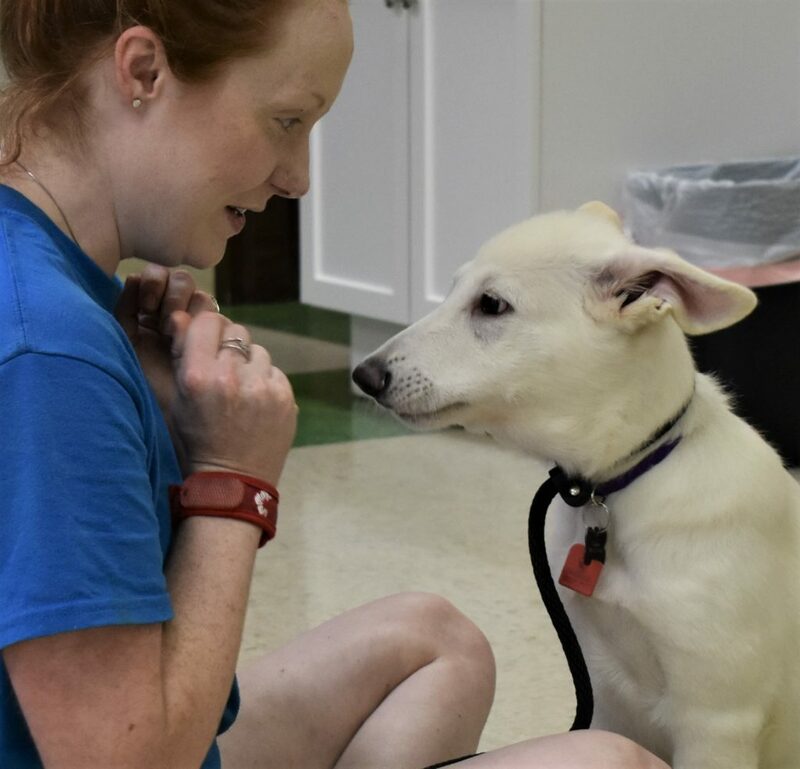 We volunteered at Cheaha Regional Humane Society and we realized something big was needed to help them and the other area shelters be able to provide socialization, basic obedience, and other enrichment activities. After all, if you go to PetSmart to adopt a dog and as soon as it comes out of its crate it knocks your four year old daughter over, you’re probably not going to adopt it! So we decided we have one more big adventure left in us, and we established the Encore Enrichment Center for Shelter Dogs. I hope you will join us to share your passion and your skills at the Center. We need your help to make it work! Charley Jones – My passion for animals began early in life, brought out by Tippy, the cat I had when I was a little girl. I’ve loved animals ever since. In my adult career, I’ve held positions in the animal field for over 14 years. My journey first started at the Pell City Animal Shelter (ASPCI) in 2003. I was the kennel manager for 12 years. During the first year I was there, we took in over 8,000 animals. I soon realized my career choice was not going to be easy. There just aren’t enough adopters and homes open for each animal. Unfortunately, euthanasia was the main solution for overpopulation during that time. By 2008 however, things took a turn for the better. ASPCI opened a spay/neuter program and partnered with PetSmart to promote more adoptions. In 2010, we started coordinating with rescue groups and even more lives were saved. It was a huge blessing! However, in 2015 ASPCI did not renew their contract with the city. Even though ASPCI shut down, I still pushed forward in the animal field. I moved on find Cheaha Regional Humane Society. I worked there for almost two years as the director. We had some successes, especially in the areas of rescue animal transport and ensuring spay/neutering of adopted pets. But we also faced overcrowding and resource constraints that kept us from being able to place more animals with good families who would care for them forever. Throughout the 14 years I’ve served as a shelter employee I have experienced many situations most people couldn’t imagine. Between euthanizing, medicating mangy animals, seizing over 200 animals from one location, assisting in rescuing dogs in two separate puppy mill cases, prosecuting several cases for animal cruelty/neglect, and socializing animals that are beyond scared of humans, I found that each case strengthened my love and passion for animals. Now I apply my experience at the Encore Enrichment Center for Shelter Dogs. I want to keep improving the lives of homeless animals by helping them become more sociable and highly adoptable. I love bringing shelter dogs to Encore to give them some time in a clean, quiet, FUN facility and a break from the stressful kennel environment! I know it improves their quality of life and increases their chances for adoption. Whitney Martin – My mother’s job choice brought out my compassion for animals. She introduced me into the shelter environment when I was four years old. I started actively volunteering when I turned seven. Between cleaning cages and dishes, socializing animals that are beyond scared of humans, assisting in the rescue of puppy mills, and promoting adoptions, my love for animals grew over the past twelve years. Growing up, I always wanted to become a veterinarian. In both the vet and shelter environments, the people make a huge impact. The difference is the shelter animals do not have a permanent home or family. Some never even experience the touch of a loving hand. Which is why the shelter environment hits my heart a lot harder. I came to the conclusion instead of working in a vets office and only medicating owners pets, I would rather be involved with the shelter animals. I am a Sophomore at Jefferson State Community College. After completing my first year of basics, I changed my major from pre veterinary medicine to radiology. Although radiology will become my career, I plan to work with shelter animals during my spare time. The Encore Enrichment Center gives me that opportunity. Ashley McDonald-Hey everyone! I am Ashley McDonald and I was born here in Anniston, AL. I have always had a love for animals of all kinds. I lived with my grandparents when I was young and they allowed my love for animals to grow. I can remember the first animal I cared for and nursed with a bottle was a 3 day old nanny goat. But not only did we have my wonderful nanny goat, we had Shetland ponies, chickens, a few barn cats and such, but my very favorite was my dog Sunshine. She was there before I was born and I swear that dog would have done anything for me. She followed me everywhere. Even then, I knew that I wanted to work with animals when I grew up. As I got older other animals came and went but my first love was my Applehead chihuahua, Tiny. She was like a first child to me. She lived to a happy age of 16 years old. My next dog would be a relationship that surprised even me. I was newly married and we didn’t have the fence at my new house completed yet so we weren’t yet looking for a dog. I was at the vets and noticed a cute little puppy running around the office. I made the comment that he looked like he had some German shepherd in him and the receptionist said “We’re not sure but we do have a white German shepherd in the back.” I swear my jaw could have literally hit the floor. I had dreamed of having a German shepherd one day so I had to meet her. I fell in love instantly when I met Mika. It was like she was meant for me. Mika hadn’t had the easiest life. She was 7 months old and had been hit by a car at 3 months old and needed a hip replacement. The vet had graciously allowed her to stay with them while she had time to heal. I quickly figured out that at some point Mika’s trust with people was broken. She was terrified of everything. I had to figure out how to help her. I couldn’t stand to see her so scared all the time, so I started learning everything I could online. I then signed us up for training classes once she was ready. She excelled at everything! That surprised everyone, including the teacher. She told me that she thought Mika would make an excellent service dog because she knew I suffered from systemic lupus, and the rest is history. I now use everything that I learned to help Mika, to help other dogs that suffer as she did. We at Encore believe that every dog deserves a chance to be the very best they can be. To me, they all deserve the chance to show just how amazing they can be, just as Mika did for me. Alex Bain – I have always loved dogs and knew I wanted to work with them ever since I was a little girl. I have had dogs all my life from a Jack Russell to Labs. I have two dogs currently, a Blue Heeler mix named Cricket and a Lab puppy named Remi. I have been around shelter dogs for a few years now. I started out volunteered for a couple of years at Pell City Animal Shelter (ASPCI) and loved it. I quickly realized I wanted to be a employee there, but I was too young. In 2015 the shelter decided they didn’t want to renew their contract with the city and so I knew I had to make a decision on what I wanted to do next. I knew the animals still needed me and so I went back for a year volunteering until I was old enough to become an employee. I worked there for a few years as kennel staff until I started to really figure out what I wanted to do with my life. I had a hard time figuring out what exactly I wanted to do. It went from being a police dog trainer to vet tech, then to dog training. Seeing unwanted animals come through the shelter with behavior problems, I knew dog training would be perfect for me. When I graduated from high school I started looking for different colleges that specialized in that field and found ABC (Animal Behavior College). It is a online format which was perfect for me, I could go to school and work at the same time. When it got closer to taking my final exam I realized it was harder than I thought. I had to make the hard decision to stop working at the shelter and focus on school. I also started helping out friend Brad Strickland, who is a local dog trainer I met working through the shelter. Now, I am a graduate from ABC and a certified Dog Trainer. 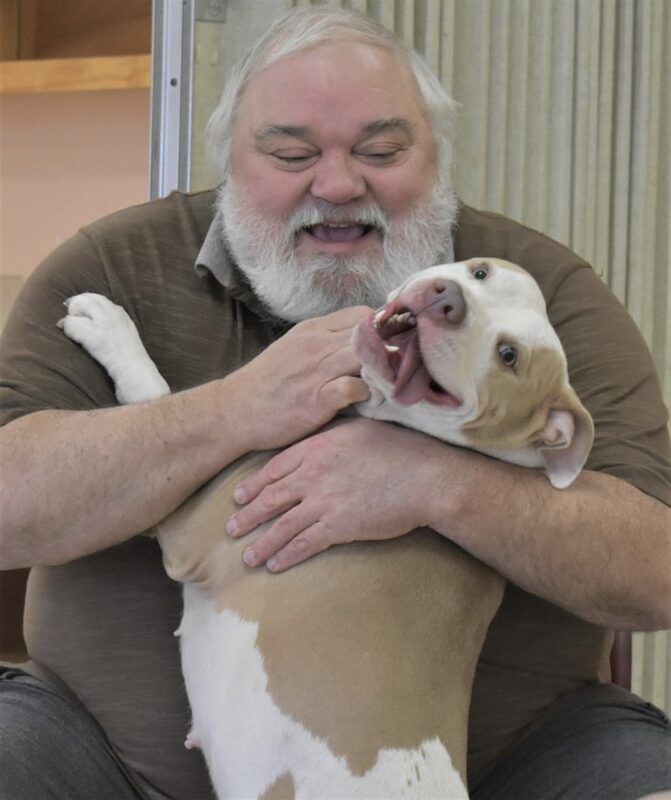 I look forward in working with the shelter dogs and teaching classes at Encore. We are a retired couple who live in Jacksonville, Alabama and have owned many dogs over the years. In 2017, we volunteered at a local animal shelter for six months and learned so much about the challenges shelter organizations face every day. 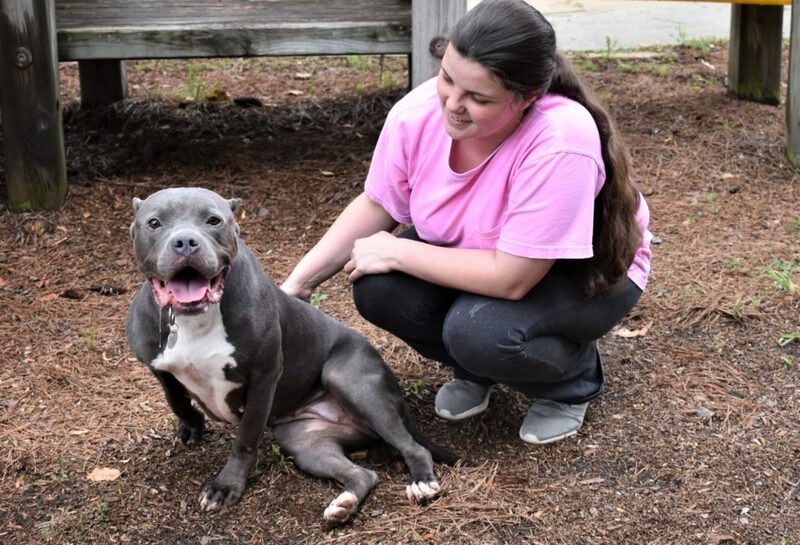 Our time spent volunteering helped us to understand just how hard it is for shelters to find the time and space needed for enrichment activities that help dogs get adopted. We wanted to do something to help. In September 2017 we purchased the former United Cerebral Palsy building at 301 EA Darden Drive in Anniston and completed needed renovations to ensure it is in good condition. The building is 8000 square feet and has large inside classrooms and a six-foot fenced outside playground area. We established the Encore Enrichment Center for Shelter Dogs as a 501c(3) charitable organization, and its activities are held at this facility. We work with the same group of 4-6 dogs for a week, to prepare them for adoption or rescue. We drive to the shelter in the morning, pick up the designated dogs, bring them to the Center and spend the day working with them. We return them each afternoon. We established a volunteer cadre, provide orientations, and lean heavily on our volunteers to help with different activities. We have been also been fortunate to get support from business groups in Anniston and Oxford to provide employees for specific projects on a volunteer basis, like re-painting our classrooms and hallways! We take photos and short videos of the dogs throughout the week and post those to social media and on our website. This helps the shelters whose dogs we are hosting, to use them to promote the dogs in their adoption marketing. 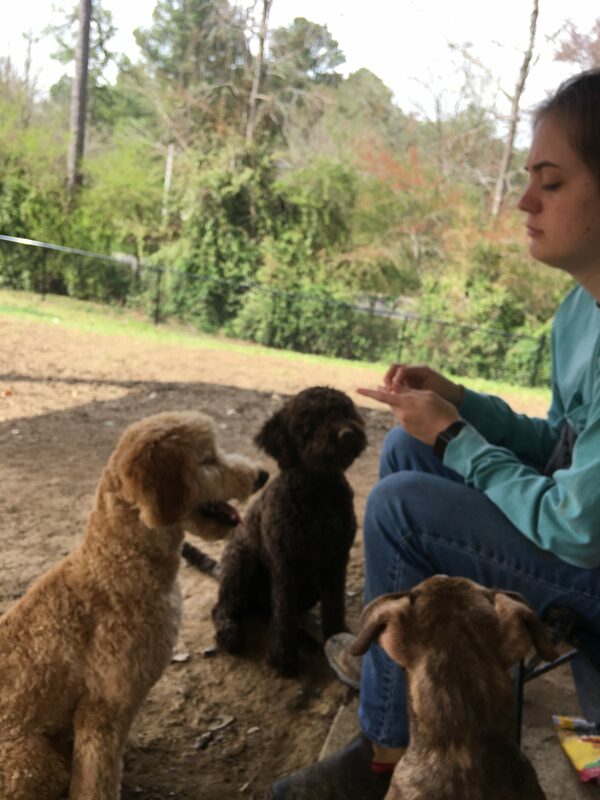 We provide crates and a van for the dogs’ transport, and we have crates in the building so the dogs can get some down time and snacks in between activities. You have our commitment that we train using humane and positive reinforcement methods. We follow a dog training curriculum developed by the Association of Professional Dog Trainers specifically for shelter dogs. Shelter staff and the public are welcome to stop by and observe us in action. We also welcome your suggestions and input on how to make our services better. This is an evolving journey and we hope you join us in making a difference in the lives of shelter dogs!